GoodCompany: Can Venture Capital Change the World? GoodCompany Ventures will announce its 2010 Venture Incubator for Social Entrepreneurs at a launch event next Thursday, March 4th from 6-8 pm in New York City. and Jacob Gray, a partner at Murex Investments, a leading double-bottom-line venture fund, and a GoodCompany board member. We'll be talking about the power of capital -- early stage and patient -- to catalyze change through investing in entrepreneurs and their innovations. GoodCompany believes that financial and societal returns are not mutually exclusive. As Garrett Melby, co-founder and CEO of GoodCompany Ventures said in a press release, "Our mission is to help entrepreneurs and investors reconcile purpose and profit. We are excited to have four such influential and innovative investors come together to highlight new models for harnessing private capital to drive lasting social impact"
GoodCompany's 2009 pilot program in Philadelphia was the first incubator in the country to adopt venture capital strategies to the needs of social enterprises. The 2009 program attracted social entrepreneurs from around the globe, in fields such as Cleantech, Education, Public Health, Social Finance and Community Development. Several companies from the 2009 cohort will do Ignite-style flash pitches at the event. Applications for the 2010 GoodCompany Ventures Program will be accepted beginning March 5th. The launch event is being hosted by GoodCompany Ventures, in partnership with Green Spaces, at their Tribeca co-working facility located at 394 Broadway, New York NY 10013. Green Spaces forwards the sustainability movement globally through widespread local hubs that incubate social and environmental entrepreneurs. Advance tickets are required for this event and are available at http://gcvpanel.eventbrite.com. "Twenty years from now, we will look back on how we get energy the same way we look back at how we got information twenty years ago," Steve Cohen said in launching the first of two cleantech panels at last Friday's Wharton Entrepreneurship Conference 2010. "Current Trends and Opportunities in Cleantech," moderated by Cohen, an energy lawyer with Morgan Lewis, also featured Dr. Stephen Tang, CEO of the Science Center, the oldest and largest urban incubator and science park in the world, along with Sean Casey from FiniteCarbon, a forest carbon development company, and Sam Gabbita of cleantech investor Element Partners. Dr. Tang, a Chemical Engineer by training, knows something about the "energy of the future" having earned his entrepreneurial stripes developing hydrogen fuel cells with Millennium Cell, which recently went bankrupt. "I took Millennium Cell to its IPO in 2000, and left in 2004. Ten years ago hydrogen fuel cells were a major focus of US automakers; at least, that's what they wanted you to believe," said Tang. "What they were really focused on were CAFE standards and keeping them from being lowered. You have to understand the headwinds." Often those headwinds are political, such as with carbon regulation. "Carbon markets are directly responsive to government action," said Casey, of FiniteCarbon. "And in the US, we want to do it our own way." Indeed, the energy industry itself may be its own worst enemy. As Gabbita of Element Partners put it, "The biggest challenge in Cleantech is that you're dealing with a commodity market made up of slow-movers." This is why some believe that we won't be able to move as fast as China in terms of alternative energy adoption. "The risk isn't that China won't adopt cleantech," Gabbita suggested. "The risk is that China is doing it now and will define the rules of the game for the future." While China may be slow to start, they have the power of the centralized government to innovate more quickly once the decision is made to move toward adoption of alternative energy sources. And, while some, such as keynote speaker Pennsylvania State Treasurer Rob McCord, recognize that the "energy sector has massive externalities that require government support," it may be best for entrepreneurs to proceed cautiously in pursuing government funding for their ideas. "It's great to get government money until you realize they are in your shorts for-ever," said Harrison Wellford of Wellford Energy Advisors in a panel on "Financing Your Cleantech Ventures." Technologies are available today to help with the transition here. However, as Ravi Barot of OxiCool suggested in that same panel, "Investors and entrepreneurs need to realize that clean technology takes time, more than other investments." And, as Steve Tang from the Science Center related earlier in the day, "The killer app of today is more important than the platform technology of the future for energy transition to happen." Global Yawning: De Boer Resigns; Should UN Get Out of Climate Biz? The UN's top climate change official, Yvo de Boer, says he will leave his post after four years, reportedly to take a consulting position with KPMG, according the BBC News this morning. He will vacate the position at the end of June, only 5 months before 193 countries will get together again for another shot at a climate deal. But after the failure of Copenhagen, lingering questions surrounding the UN IPPC and its head Dr. Rajendra Pauchauri, along with other scandals making headlines involving alledged scientific data manipulations and other shenanigans, is it time for the UN to get out of the business of climate change? Wouldn't it be better to put the collective resources spent by the 193 countries involved in climate talks into a massive R&D fund to help catalyze investments in the technologies needed to address the issue? Is Mr. de Boer himself sending a message by heading to the private sector to focus on climate and sutainability issues? Has there been a better time to be an entrepreneur than right now? Technology breaks down barriers and makes it easier and less expensive than ever to turn an idea into a business -- and traditional job venues don't seem to be getting into hiring mode any time soon. So get yourself over to the 13th Annual Wharton Entrepreneurship Conference at the Marriott in Philadelphia this Friday (February 19, 2010) to learn about "Opportunities for the Entrepreneurial Community in a Rising Economy." The conference is a leading entrepreneurship forum for entrepreneurs, investors, industry professionals, academics, and students to foster entrepreneurial innovation and leadership. This year's conference focuses on identifying and capturing entrepreneurial opportunities as the economy regains momentum or, at least, as the economy reboots. Of particular interest to readers of The Green Skeptic is the panel on "Current Trends and Opportunities in Clean Tech," which features Sam Gabbita of Element Partners, Sean Carney of FiniteCarbon, and Stephen Tang, President of the Science Center, and a session on "Financing Your Clean Tech Ventures" with Ravikant Barot of OxiCool, Mark deGrandpre of Ben Franklin Technology Partners, Emily Landsburg of BlackGold Biofuels, and Harrison Wellford of Wellford Energy Advisors. There are also sessions devoted to Health Care Services, Consumer Products, Tech and Web-based Services. Dr. Kathy Crothall, founder of three medical device companies (including Animas, which sold to Johnson & Johnson in 2006) and a Principal at Liberty Ventures Partners. The conference is trying something new this year: a Student Expo. Building off the success of last year's Start-up Expo, this year's Expo will feature both local start-ups and selected start-ups run by Penn students. Entrepreneurs will showcase their businesses and introduce their teams to the 500+ conference attendees. The conference is this Friday, February 19th at the Philadelphia Marriott Downtown. More information is available at WhartonEconference.com. Register for the event using TicketLeap. In the latest indicator that China will be eating our lunch on cleantech and renewable energy, the country has now taken the lead in new wind energy installed in 2009, according to the Global Wind Energy Council. Germany is No. 2 in total installed capacity at 25,177 MW, or 16.3 percent; China is gaining at 25,104 MW, or 15.9 percent. 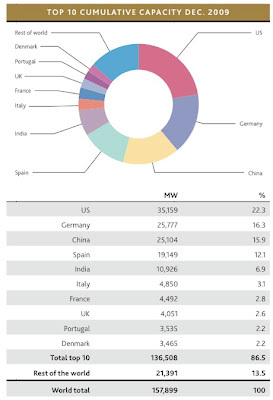 Spain (19,149 MW) and India (10,926 MW) also make the top five. I've said it before and I'll say it again: we better get our act together or all start learning Mandarin. 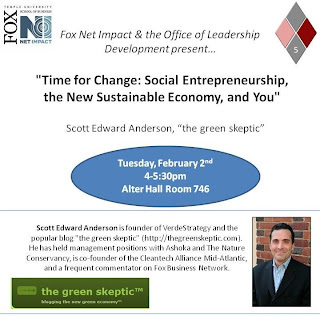 I'll be speaking today at Temple University's Fox School of Business and Management today. I was invited by Fox Net Impact and the Office of Leadership Development and will be speaking on social enterprise and the new economy. My talk, which I hope to post a link to once it is available, is about how entrepreneurs are changing the face of business and how the recent crises can, if we learn from them, drive us to build a better economic mousetrap. As World Economic Forum founder Klaus Schwab said in his closing remarks at Davos last week, we now have an opportunity to put values back into capitalism. I've long argued here that we need a new economy based on renewal, regeneration, and respect, rather than free credit, cheap oil and new housing. We can build a new economy based not on greed, but on innovation and prosperity through sustainability. I look forward to sharing the talk with you -- and, if you're going to be there, please say hello.